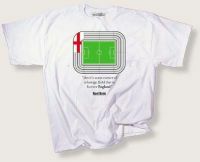 To help steady English footballing nerves what better than Horatio Nelson's words. Unisex sizes small (36 inch chest/90cms), medium, (40 inch/100cms) and XXL (52 inch/130cms) . Available as listed in drop down menu below.